Could you use some Glue Dots? How about 1,200 of them? Well you’re in luck, because that’s this week’s fantastic blog prize! To enter, let me know how you’ll use that big pile of Glue Dots in your classroom. Submit your comment to this blog by 11:59 pm EDT on October 10, 2017. Then watch your email to see if you’re our random lucky winner. Here are some other freebies and contests that fit this week’s “stick to it” theme. Teach students about 13 inspirational women who alway stuck to their beliefs. 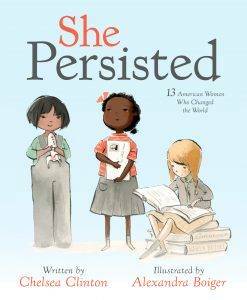 25 winning teachers will receive a signed copy of Chelsea Clinton’s #1 New York Times bestselling picture book She Persisted for their classroom. Enter here! Many students struggle with sticking to math as skills get more challenging. 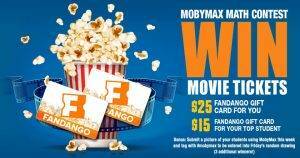 MobyMax is running a special contest: both you and your top math student can win movie tickets. Get the details—and find out how to set up your free MobyMax teacher account—here. Your school has a chance to get a new playground! Find the application at Culturelle.com. Parents, teachers, and administrators are all eligible to apply. The contest, which is part of KABOOM’s Project Playground, runs until November 15, 2017. Click here. Here’s hoping you’re a lucky winner! PS: Our Pinterest page is popping with fun fall ideas. Check them out here. I would use glue dots when doing projects with my class. They would make cleanup much easier and the projects won’t have to dry before putting them up. Glue dots would be very helpful with my primary aged students in special education at our school. We love to incorporate art into our lessons. I would use glue dots for math projects. Math needs to be hands-on, and glue dots would certainly make the math lessons less messy. They will also keep the students more focused on the math and not be worrying about putting too much glue on their paper, getting glue on their clothes, cleaning up the glue, etc. Glue dots would be great for kids who struggle with fine motor skills. I will definitely get some of these for my kiddos. Glue dots are perfect for many of the art projects that we do in my pre-k class. Glue Dots. . .what’s not to love? Wow, what a concept! So easy for little fingers to use, so easy for teachers to clean up (none at all!). I would use those little dots anytime we need to attach one object to another! Glue dots can be used everywhere! I would use them mostly for art projects! My kiddos will make beautiful holiday centerpieces to share with their families! I would use glue dots with my young 3 year olds who do not understand how to use other glue! I would use them for art projects. No drying time! I would use them on everything!! Math, reading, art, science/social studies lessons, projects! Less mess, more fine motor practice. I would love to win a giant pile of glue dots. They would be used to stick charts and work on the walls and cabinets. They would be used in art activities, interactive notebooks, and so, so much more. I would love to use these with my special education classroom. Many of my students have sensory challenges with glue. These would enable us to complete projects calmly and with a sense of accomplishment. Craft projects, literacy connection projects, math projects…the possibilities are endless!! Craft projects! They are perfect for googly eyes! We would love to use glue dots for those little eyes, noses and ears on our masks. Mahalo for the opportunity to win a bunch. Yes! Glue dots are so much easier to use for ALL of those interactive notebooks!! They are faster for the kids to use, and they are certainly neater! On a side note, I use them instead of glue sticks for my 8th grader …. easier to fit in a binder pocket so he can carry them around. For class projects and fine motor skills. I would also share them with the parents so they can see how to use them at home. We do a Memory Book where we do hand prints or foot prints each month. We add poems, art work, or writing to these pages. Glue dots would be a wonderful addition to this project for the class. I work with 2 and 3 year olds. We go through many glue dots for art projects, because they are so much easier for the little ones to use. We don’t have to worry about too little glue (things fall apart) or too much glue (messy). And they work with many different media. I make a scrapbook for each child in our class. I take pictures and keep some of their artwork. I present the scrapbook to wach parent on the last day of school. My books are called Kindergarten Memories. The glue dots will be used for this purpose. Use Glue Dots all the time in my classroom for making work tasks for my students with autism! They are great! Glue dots are the very best glue you can have in a classroom of two year olds! They make crafting quick and easy, are easier to handle than glue bottles or sticks, and work well on hard to glue items! Glue dots give the children more opportunity to be creative! I would use these to further the education of my students through crafting and creative projects, and I will share with all the threes and fours also! Thanks for this opportunity! I would use these glue dots to help make my 18 students Memory Books for the school year. Thanks! These would be great in a preschool classroom for fine motor skills. Craft and art projects are so much easier with glue dots. No drying time and they can hold those heavier pieces together! Glue dots would be used for crafts for my two year old preschoolers crafts! Anything to help make it easier! One of the ways I would use glue dots is to get the ball track toy to stay stuck together instead of constantly falling apart when I pick it up to move it in my toddler classroom. I would share them with the teachers at our school to make lots of great things! I would attach items to a light box when working with students with vision impairments. I have a STEM kit in which the students need glue dots to build pollinators. I would use the glue dots to refill the kit that I use with over 100 second graders each year. Glue dots are a must have in first grade. Starting stem projects soon and these would make construction so much easier! Glue Dots have helped me when I work on Graduation Decorations. I also like Glue Dots when I am doing quick projects in the classroom. I would use them on everything in the classroom 🙂 I hate using elmers glue with Kindergarten students. As a PreK teacher, I could use them to make all the things! Games! Student displays! Projects! All the things! For Googly eyes on projects. Glue just does not make the cut. Glue dots are great for art projects and classroom organization. Labels are a must in a first grade classroom. As a teacher who loves having a maker culture in my class, these dots would offer another opportunity for young minds to explore. I encourage students to learn about the properties of the different materials in our maker area so they can make good choices about what to use for a particular project. Glue Dots would be ideal for jobs that need more than glue sticks to stick. Liquid glue is frequently our nemesis because it is hard to get things to adhere, it is wet and you have to wait for it to dry. Glue dots would eliminate all these problems and could help make some amazing engineering happen! Oh my gosh! We use glue dots daily in my classroom. I teacher special needs students and I have a few of them that cannot handle glue due to sensory issues so we use glue dots instead. I also use glue dots when making manipulatives and learning materials with my cricut machine. I would make the glue dots available with foam letters, shapes, and assorted pieces to allow students to stick those foam pieces to paper on a vertical surface (paper on a wall). I would encourage a community project. I am sure the children would think of many more uses for the glue dots, as well. We would love to have glue dots!! We can use them in so many ways, bulletin boards, crafts. Yes, glue dots would be great!!!! As a Resource teacher I find that I have to make many of my games and manipulatives. Glue dots are fabulous, and let’s face it, I do nothing but burn my fingers with glue guns! I would use them to putanchor charts on the ceiling in my classroom. There is never enough wall space!! These would make interactive notebooks so much easier for my kiddos!! The glue for would be a great way for the student hang up their artwork easier. They would also just be handy to have around the classroom for different stuff. Glue dots would make project time run much more smoothly – and make clean-up time a breeze! I would use them to hang up pictures of my students during center time and hanging up their work. For everything!! My watch band broke the other day. I put a few dots to keep the strap down and it stayed for days! Interactive notebooks! My fifth graders still struggle with too much glue!! I also love glue dots for attaching laminated labels to all sorts of things. So many uses!! My kids would love these and so would I. They are perfect for gluing wiggly eyes on all kinds of projects! I would first use them to put together our handprint calendars we make for our families for Christmas. The next project I would use them our the end of the year memory books I put together for my students!! I would use them with every craft that requires glue! I use them in my kindergarten classroom all the time! Google eyes, pipe cleaners, foam shapes & so much more sticks when using glue dots!! My 1st grade is learning to read. glue dots would be the perfect thing for me to use to stick “labels” of sight words around the house! I would use the glue dots to attach the CD case of a audio book to the inside cover of the book so the cd doesn’t become lost or misplaced. I teach preschool and use so many different kinds of visual aids that I laminate and then attach with velcro (using lots of glue dots). That way I can change visuals and cues to adapt to what is needed. I also use a linear calendar that uses a great deal of lamination and glue dots. We also do ALL KINDS of art projects and glue dots have never failed us when we need certain pieces to stay put! I would split the glue dots between my five schools I teach at daily and use them to hang student work and pictures of us learning cooperatively in class. I would also use them to make my room more colorful by hanging music terms on a word wall. I would also use them to hang CDs that accompany some of my books and games together with their materials so they do not become list or damaged. Thank you for this opportunity. I love these for crafts especially when making ornaments and for special occasions. The possibilities are endless, but with our concrete walls, I have trouble getting posters and charts to stick to them. I’ve tried everything, but glue dots. I would love to give them a try. WAY MORE than anyone else!! And they would be GREATLY appreciated!! Oh my goodness, I know my class will use a ton of these! We use them when we make the reindeer ornaments with their fingers to glue on the eyes and bows for girls. They are adorable! The question is, “What wouldn’t I do with them?” I wouldn’t glue them to eyeglasses, unless one of the students had broken glasses and needed a quick fix! You could use one of these little beauties to quickly help a child see the rest of the day! And while I was fixing my students glasses one of the posters fell off my wall, so now I have to try and find something to deal with the weird atmosphere in the building that makes everything fall off the walls! Wait! It worked on the glasses so surely it will hold these puppies up on the wall! There are so many things I can name that I would do it’s a much shorter list of what I couldn’t do. Like fix the sole of a shoe. Oh. Wait a minute. This doesn’t include all the things the KIDS could do with them! Oh my goodness! I bet this could be a great critical thinking question for them! Question: Please tell me ways these awesome glue dots could not be used! ???????? They would have to think hard! Higher order thinking? They would tell a way they couldn’t be used and another student can chime in and discuss why that’s wrong and how it COULD, in fact, work! Oh, the places you could go with these little babies!